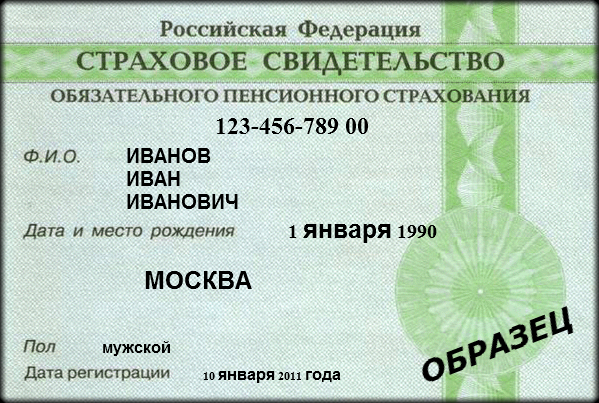 Under current Law, citizens of the Russian Federation must be insured in system of obligatory pension insurance. A certificate confirming this is card a social security number that lists the insurance number of individual personal account. - identity document of the legal representative of the citizen. In SNILS provides key data about the insured person: individual insurance number; the full name, date and place of birth; gender; date of registration in the pension insurance system. Social security number is unique to this number are recorded all the data about charges and payments by employer insurance contributions, and complete data on the insurance experience of the citizen in the course of his employment. These data are subsequently taken into account in the calculation and recalculation of pension payments. All citizens have the right to obtain personal insurance number the pension insurance system, including newborn children, disabled citizens, disabled, military. To obtain a social security number must apply to the territorial office of the Pension Fund at the place of residence (residence permit). You will need a passport or another ID, after which the employee will be asked to complete a questionnaire and let you know when you will need to approach for obtaining a social security number card. By law for this procedure is given 10 working days. You can get SNILS through their employer – when a citizen gets a job first and has no seniority. In this case, the human resources Department, the employee fills in the questionnaire of the insured person and the employer shall, within two weeks from the date of the agreement to transfer it for check to the PFR. . When making cards SNILS child in the FIU Department needs to contact his legal representatives, present the documents proving the identity of the child and the representative (the parent), you also need to fill out a questionnaire. If you change the questionnaire it is necessary to apply on the exchange of evidence. In this case, you will receive a new document, but the insurance number will remain the same. With the loss of evidence also need to contact the FIU Department or to their employer with the application for issuance of a duplicate. The time allotted for the issue of a duplicate is also 10 working days. No need to fear that the data specified in the social security number will be used: all account information strictly confidential and data transmission via electronic communications is encrypted. Social security number must be retained by its owner, no one has the right to take it, including the employer. In the future we plan to combine karma medical insurance and pension insurance into a unified system with the release of universal electronic cards containing full information about the owner. With its help, you can get access to many services including banking.